Hold dispenser 12 to 15 inches from face and depress actuator while leaving eyes opened. Begin misting at side of face and move canister in a sweep across open eyes for one to two seconds. May be applied while wearing contact lenses. 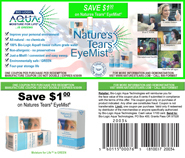 Compatible with all eye drop products. And yes, it’s OK if you blink (enough moisture will get in). Hold eyelids opened with fingers and spray mist directly into affected eye from three to four inches away, until eye floods and irritants are gone.